Argentina play Iran in the World Cup 2014 group stage match. The live match between Argentina and Iran starts at 12 p.m. ET on Saturday. This match can be watched live on TV or through Argentina Iran Live streaming. The links for Argentina Iran live streaming have been provided in this article. Argentina Vs Iran match highlights and goals can also be viewed on this website after final whistle. Favorites Argentina would look to qualify for knockouts against Iran in their second match of this World Cup 2014. Iran were able to salvage a draw against Nigeria and would be looking to cause an upset against Argentina. Argentina can be expected to be much more attacking than they were in their 2-1 win against Bosnia. While Argentina did not look in top form, they still have two matches to sort their form before knockouts. The Argentina vs Iran World Cup match can be watched live on these TV channels:in the USA (ESPN, Univision),in Canada (CBC Live), in Australia (SBS) and in the United Kingdom (BBC One Live). For Online Streaming of the Argentina Iran match, use this link. A few minutes before Argentina Iran match, come back here on TechNews.org to know everything about live stream of the game. And at the end of the match, fans can also watch Argentina vs Iran match goals in video with score, and highlights of the game. Argentina would be looking to find their form before the knockout stages. Argentina can be expected to field a 4-3-3 formation for this match, with Lionel Messi leading the charge. Having attackers like Aguero, Di Maria and Higuain, along with Messi, makes this Argentina side extremely good in attack. Mascherano and Maxi Rodriguez may play in the mid field which needs to feed more balls to their explosive forward line. Iran have not been very imposing and would be looking to somehow come away with a positive result. Iran may go with an unchanged side which were defensively strong against the Nigerian side. Iran did have a few good chances in their last match and would like to make the most of whatever chances they get against Argentina. Iran would take heart from the number of upsets which have taken place in this World Cup 2014. However, realistically they would be looking to minimize damage and aim for the second spot in this group. If they can come with a draw or a win, they will back themselves for a good show against Bosnia in the last group match. Argentina would be looking to shrug off their low goal scoring of the previous match. Seen by many as favorites, Argentina may well go into the knockouts with an easy win. All eyes would be on Lionel Messi who was able to find his range against Bosnia in the last match. The score of this match may well depend on how much space the Argentina forwards can find themselves in. Argentina would go into this match as hot favorites. Iran will have an uphill battle right from the start against a World class forward line. If somehow Iran can close spaces, attack on the counter and take the game to Argentina, we may well have a match on our hands. But by the looks of it, it looks like an easy win for Argentina in the Argentina Iran World Cup match. 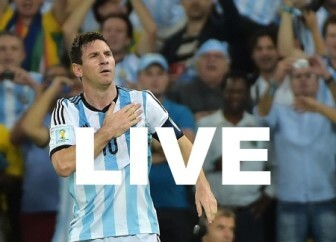 Catch Argentina Iran Live streaming on this link. With so much action in store, do check the Argentina Iran Live Stream. Also, tune in for all the goals and highlights along with the scores of the Argentina Iran match, available on this website right after the match. Thanks for visiting the Technews.org website and be sure to watch all the action from this Argentina vs Iran match live. Be sure to bookmark us and check all the videos and news articles regarding the World Cup 2014 matches in Brazil.